Fresh organic pork loin ribs – an easy crowd-pleaser. These come as a rack, so you can cook them whole or divide into individual ribs. Cook low and slow in the oven, then finish on a hot barbecue for meltingly tender meat with a smoky, crunchy crust. Approximately 2 pork ribs per pack. 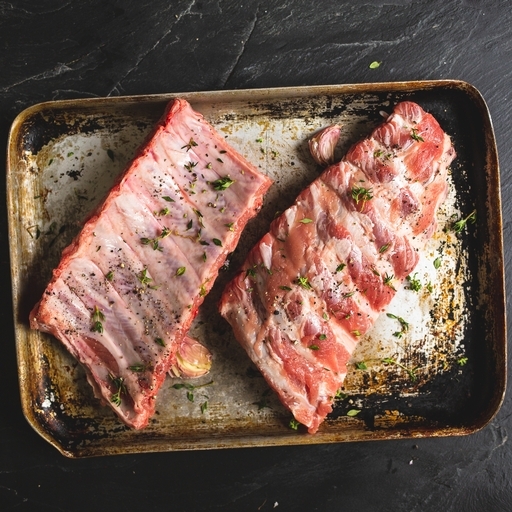 Try Bob's sticky, marinated pork rib recipe here. Season the ribs well. Slow cook in a covered roasting tray with a dash of water at 160˚C/Gas 3 for 2½ hours, until tender. Cover with your BBQ sauce of choice and finish on a medium BBQ for 20-30 mins, turning and basting often. Alternatively, finish uncovered in the oven, turning often, for 30 mins at 200˚C/Gas 6.